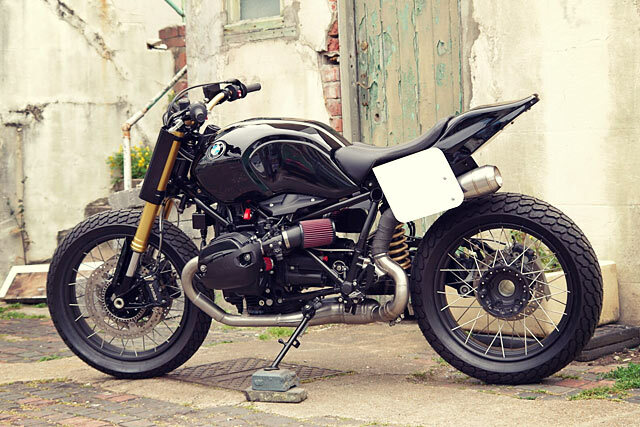 BMW’s R nineT. 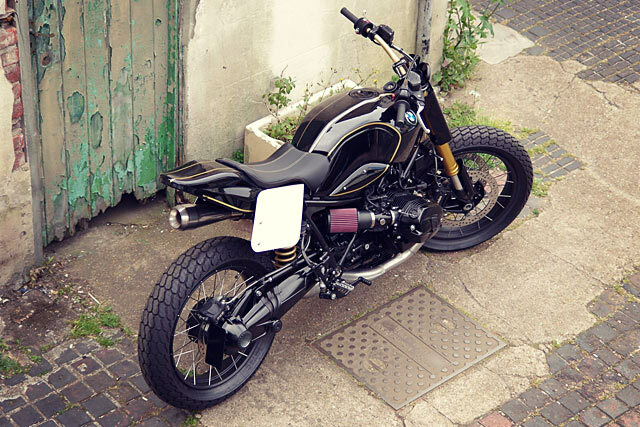 Most customised factory bike ever? While we’re pretty sure that the Guinness Book of Records doesn’t have a category for such trainspotting (or bikespotting?) malarkey, there’s nary week that goes by without us seeing another one slide sideways into our inboxes. 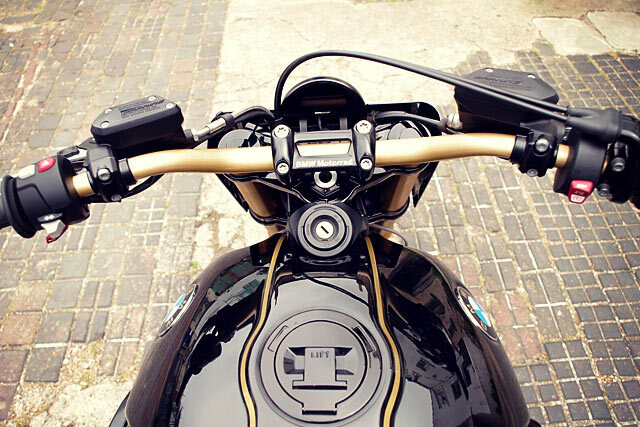 But apart from two notable attempts by some guy called ‘Roland Sands’, not too many of them are honest to goodness flat trackers. Until now, that is. Brighton, in the south of the UK, is home to a big pier, some very aggressive rockers & mods, and a shop called Pier City Cycles. 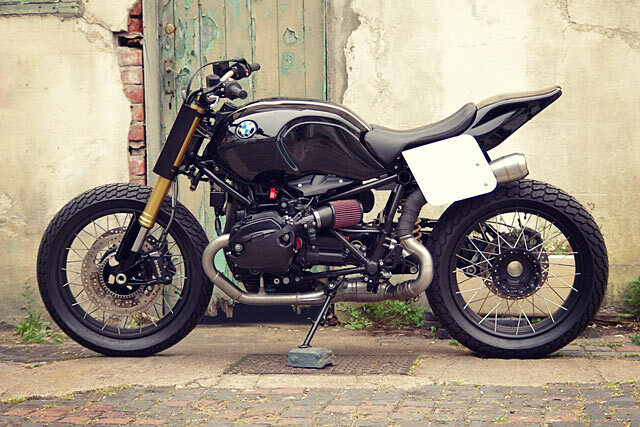 This is their latest build, simply called the ‘R nineFT’. “We’re Pier City Cycles”, says shop owner, Rory. 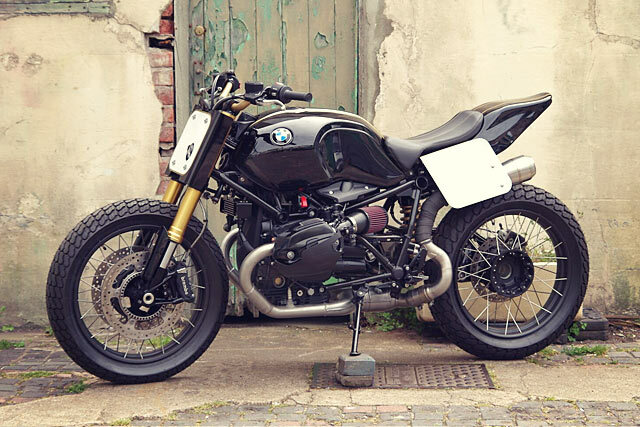 “We used to work for a BMW retailer; we love the brand and the bikes that they produce, but we decided that our passion for bikes wasn’t in processing warranty work and hitting numerical targets. We wanted to work on custom bikes exclusively, so we set up a workshop in the centre of Brighton and we haven’t looked back since”. The boys wanted to create something that they could say no-one else had already built. 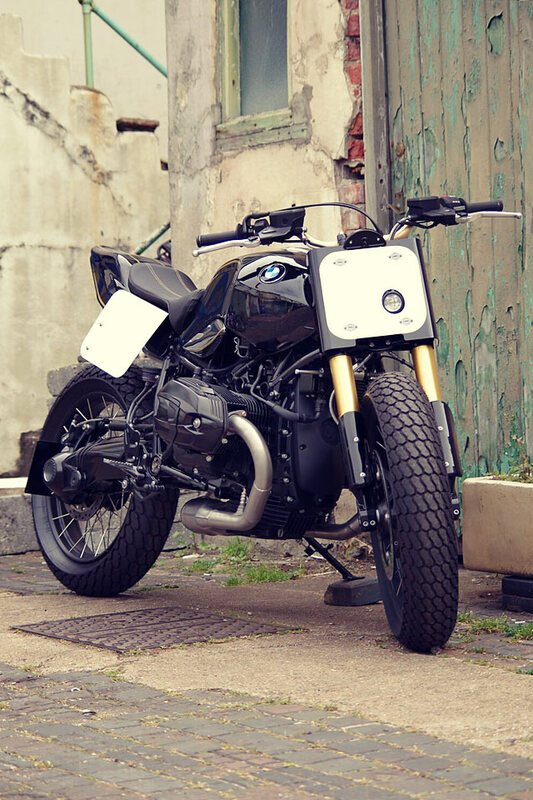 After looking around and a fair chunk of Googling, they were sure that there was a gap in the R nineT scene that they could squeeze a Super Hooligan Tracker into. “We had seen quite a few street trackers, but no builds that were legit flat trackers or bikes that were fully homologated for the Roland Sand’s-created Hooligan races. 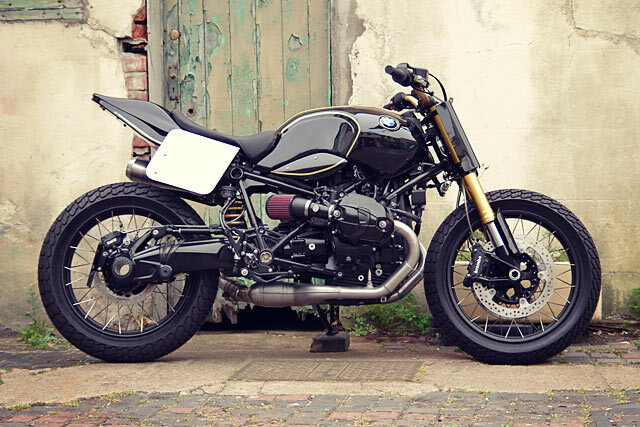 At the time we were also a little disheartened with some of the ‘same old’ R nineT builds that we had seen, so we wanted to inject something new into the scene”. The project was started while Rory was still working at a local BMW dealer, but it was quickly put to one side when things got busy. When he left the business, they told him to put it back to standard. “I didn’t want to see the time and effort we had already put into this project go to waste, so I put my money where my mouth was and I bought it. 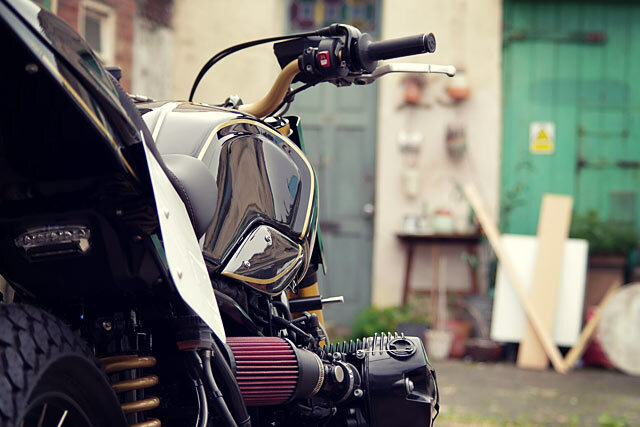 We had already gone to the effort of making up some 19″ flat track race wheels, a bespoke sub-frame and various other handmade brackets and panels”. They didn’t want to change anything mechanically, as the bike was running beautifully and was deemed perfect for a bit of flat track racing, with its beefy low-end grunt. “So we set about reading the rules and regulations of the DTRA Hooligan series and started to look at how we could work them into the bike”. The key part of the build at this point was to make sure that the bike was able to run on 19″ wheels. 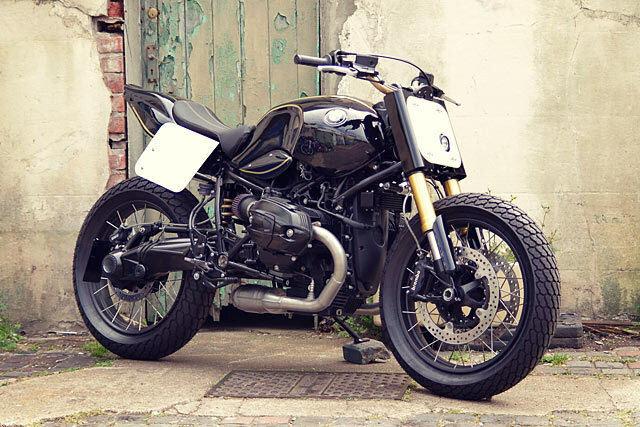 Rory managed to source hubs and rims from various BMW R1200GS models and, like a new pair of school shoes, he then went about having them properly laced up. “It all came together in time for the Bike Shed show with the aid of some strong coffees and a bit of good old British huzzah”. “Once this was complete we realised that the paralever would not be long enough to accommodate the larger wheel size, so we made up a longer, and fully adjustable, unit”. After this, it was all about making the panel work look right. “We had to raise the seat to incorporate the number boards and seat unit, as well as giving it a more aggressive stance for racing. Coupled with the larger wheels, it’s a lot taller than the original now”. 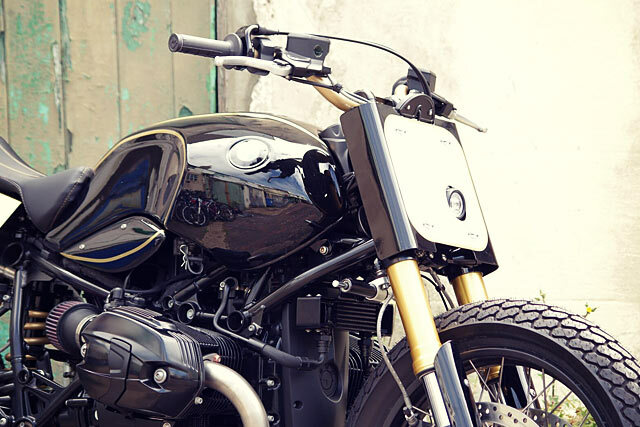 There were a few other rough patches along the way but, as with any build, it all came together in time for the Bike Shed show with the aid of some strong coffees and a bit of good old British huzzah. From a practicality point of view, having to move the project from an established workshop to a new space meant they had to work around a lot of things. “At first we didn’t have any of our usual tooling, so everything became five times more difficult to do. It took around 4 weeks just to complete the seat unit the way we needed it; at the time you wonder what you’re doing, but now we’re really pleased with the result”.